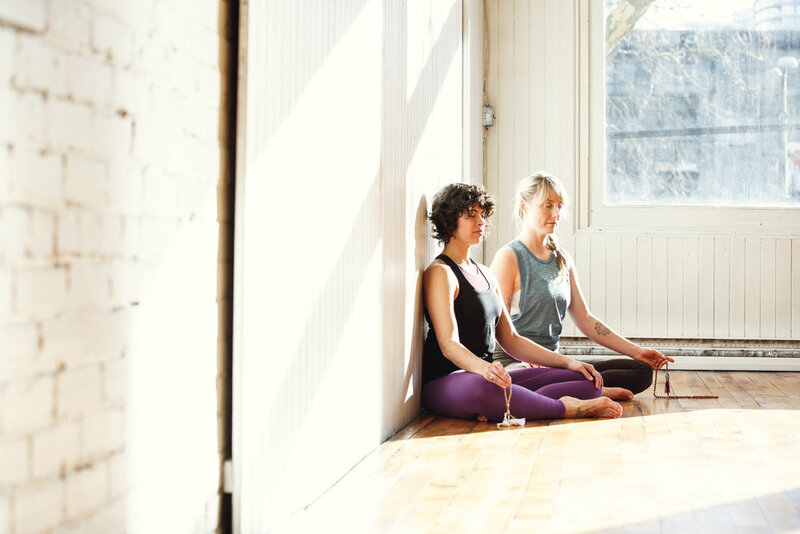 Diving into a teacher training is not just for those who want to teach yoga, but also for those wishing to create a greater connection to breath, community and their inner teacher. This program focuses on the principles for living a balanced lifestyle in a modern society and how to be a role model for others. – Why Yoga? What yoga means for us in the present day, why do we practice, how should we practice and how can we share it effectively with others? – The Yoga Postures: detailed alignment and anatomy through daily asana labs to break it all down and build it up methodically. Anatomy portion taught by Erin Moon, ERYT-500. – Hands-on Adjustments: the delicate actions and ethics of touching and assisting others. – Sequencing: an important chapter on intelligently sequencing yoga poses and creating seamless vinyasa flows with a heating element, peak poses and a calming cool down. – The Roots: philosophy, Sanskrit pronunciation, overview of various lineages that contribute to the yoga we know today and history of the yoga tradition. – Pranayama: various breathing techniques and gentle practices to understand our vital life force. – Subtle Body Energies: chakras, nadis and other unseen lines flowing through the body. – The Healing Powers of: mantra, meditation and the ancient medicine of Ayurveda. – The Business of Yoga: how to get started, authentically integrating the many hats of a yoga teacher, settling in to your own voice, boundaries, honing in on a niche and your passion for teaching. – A daily yoga, pranayama and meditation practice. Because the best teacher is a lifelong student. – Applied hands-on teaching experience. Jump right in to practice teaching. Discover the authentic voice within. Clara and Carolyn are passionate about and committed to providing registered trainees with as much hands-on time teaching as possible during this training. – Exploration of anatomy basics in your own body. Learn anatomy from the best of the best and how it directly relates to yoga postures and to finding safe alignment in all poses. – Feedback on sequences and practice teaching. Growth comes from discussion, asking questions and learning ways to improve. Carolyn and Clara provide a safe environment for feedback on the physical and subtle aspects of teaching. – Relevant and personal stories/sharing. Your path and all that has led you to this moment is important. Explore ways to share your story while listening and connecting to the journeys of others. – Contemplating your unique body and the wisdom that lies within. Yoga is a practice of experimentation that spans our entire lifetime. We all require different poses and types of movement at different stages, but if you can honour and appreciate your phase at any given time, your respect and understanding for others will be instantly felt. Tune into your self, your wisdom and uncover how to teach from this place. ** This course was carefully designed by Clara and Carolyn for anyone with two years of Vinyasa practice. Posted on June 22, 2016 by Carolyn Anne Budgell and tagged yoga retreat training teacher wellness sri lanka.